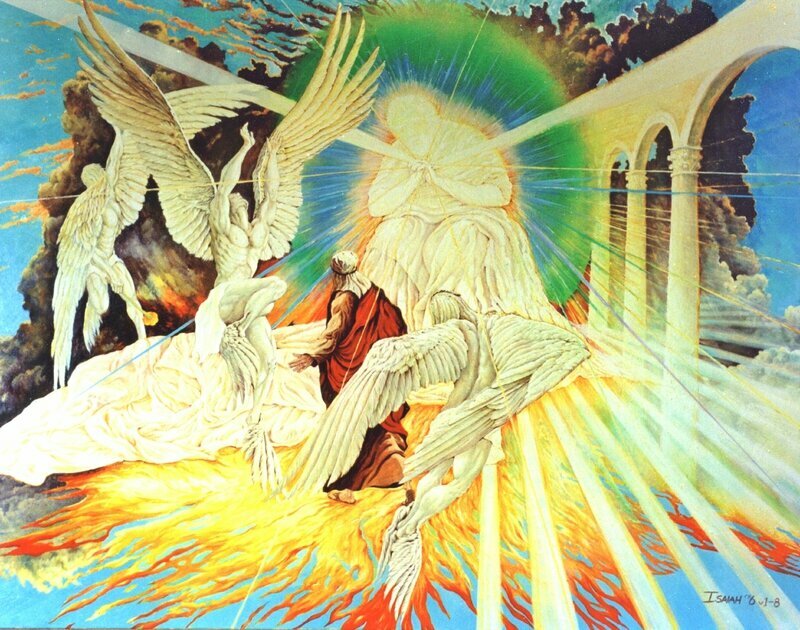 In 2001 -2002 I was led to paint Revelation chapter 6: 1-17. 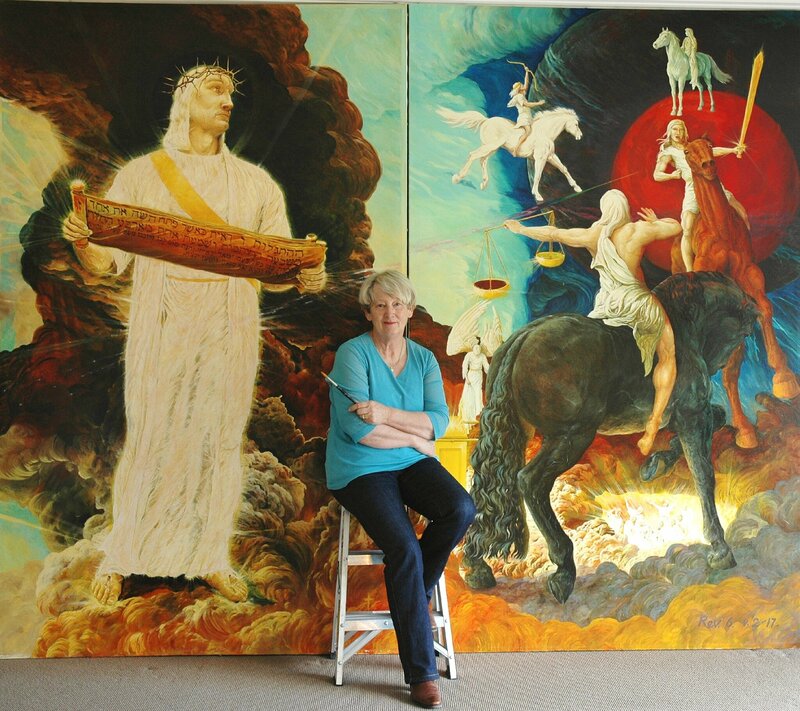 Revelation chapter six was the second painting in a series of four that followed Isaiah chapter six’s message of “Whom shall I send? And will go for us?” after September 11th.2001 terrorism attack on America. 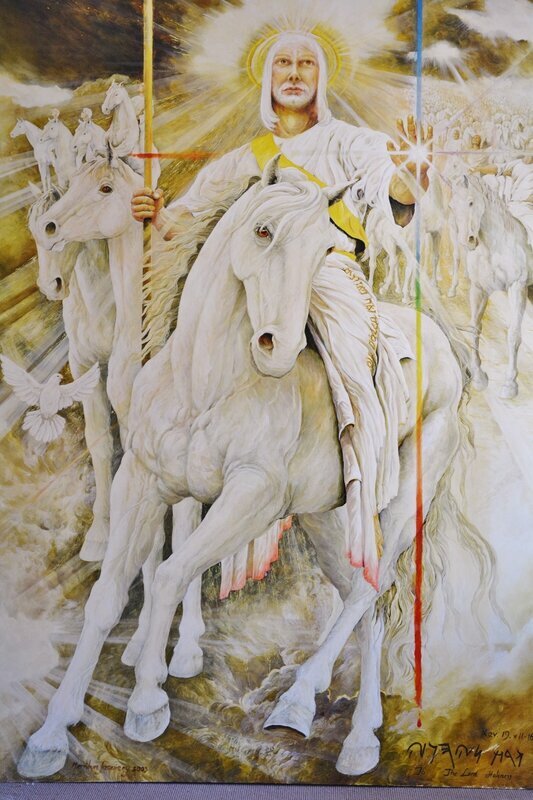 Revelation 6 took one year to complete; some six months earlier while sketching a pre-study of the black horse and its rider I was guided to position the Black horse in the forefront of the painting. I didn’t know why at the time but I was obedient to what I was called to do. The Black horse is the third seal to be opened by Jesus, the Lamb of God who is worthy to open the seven seals. Vs. 5-6: When the Lamb broke the third seal, I heard the third living being say, “Come!” And I looked up and saw a black horse, and its rider was holding a pair of scales in his hand. And a voice from among the four living beings said, “A loaf of wheat bread or three loaves of barley for a day’s pay. And don’t waste the olive oil and wine. The Black horse is symbolic in type of a famine; this rider holds a pair of scales in his hand, weighing both the oil and wine. The olive oil and the wine are weighed and measured, not to be wasted. Spiritually they represent the anointing and fruit of the Holy Spirit. There have been many famines ever since the world began; generally they are caused by extreme weather patterns. Black is symbolic of something that has been burnt or charred by fire. We see this in Joel 1: 19-20. To you, O LORD, I call, for fire has devoured the open pastures and the flames have burned up all the trees of the field. Even the wild animals pant for you; the streams of water have dried up and fire has devoured the open pastures. Revelation 6: 5-6 also records that it will take a day’s earnings to purchase a loaf or two of bread. Water too is essential for life; we will die without it. Our bodies consist of 65-90 per cent of water and that is why we need it. But of this waterJesus said, ‘Everyone who drinks this water will be thirsty again, but whoever drinks the water I give him will become in him a spring of water welling up to eternal life.’ (John 4: 13-14) This water is the life – giving source of himself, the Spirit and his word. If we lack this spiritual water then our souls and our spirits will die in their natural state. This is what I believe the 2001-2002 timing and prophecy of the black horse to be. Amos 8: 11- 12 “The days are coming,” declares the Sovereign LORD “when I will send a famine through the land-not a famine of food or a thirst for water, but a famine of hearing the word of the LORD. Men will stagger from sea to sea and wander from north to east, searching for the word of the LORD, but they will not find it. If the word of the LORD is unable to be heard or found in the future then, just like those who die from a lack of water in a natural famine or desert, so too the spiritual man will die from thirst of the life –giving source of spiritual water of eternal life that Jesus talks about in John 4: 13-14. My belief is the famine of hearing the word of the LORD that Amos 8: 11-12 speaks of, will be so devastating that the boundaries of all moral values will be nonexistent. I also believe that you will need to hold on to your old bibles in the future, because possibly future government laws will be passed to bring in a political correctness to what can be preached, and what cannot. This in turn will bring a famine of hearing the full gospel truth of the word of God that Amos speaks of. What a challenge for future Christianity. In the future I liken the word of God (the bible) to an old original recipe. Along the way the origin of the recipe begins to change when a new ingredient is added to it disguising it as the old one, in essence the new ingredient makes it more palatable and more saleable. But the new ingredient is strange and foreign to its creator. Matthew 24: 35 Heaven and earth will pass away, but my words will never pass away. Tags : don't waste-oil and wine, end times famine of the word of God, Jesus, prophecy, Prophecy of Black horse, Revelation 6.